Posted on April 5, 2018 April 11, 2018 , in Hot Tubs. Purchasing a hot tub can bring about excitement for the whole family. As soon as that order is made, plans are quickly discussed in the home about where to put the hot tub and make the most out of the relaxing soaks, therapeutic massages, and entertainment. However, before plans get too intricate there are some things you should confirm and be made aware of. First, confirm the delivery date and installation. Knowing this will allow you to properly plan how and where to install your hot tub. This can be especially true for backyards with beautifully crafted landscaping and those looking to strategically place their hot tub to get the most out of the experience. If you are interested in learning more about how to make your backyard the perfect setting for your hot tub dreams, keep reading! Looking to create the feeling that you are in a warm hot tub on a tropical island or surrounded by the jungle? All you would need to do is situate your hot tub on top of a deck or concrete slab, being at the center of a sea of beautiful vibrant plants. For fun, include bright and tropical flowers or bushes. Fun tiki style lanterns can help transform your area into an even more relaxing oasis. This would be especially enjoyable for stressed-out teens or adults who have spent their entire day in an office. One option is to build a deck or patio for your hot tub. Creating specific areas like these can provide both intimacy and privacy for hot tub moments in any given backyard. If you are looking to up the privacy, even more, add a screen or gazebo top. These can both create a sense of privacy and allow the sun to be blocked for those who wish to avoid it. Accessorize your area with benches, a grill area, outdoor kitchen, showers, and towel area. Create the perfect space to entertain and you will find people enjoying a lot more than just your hot tub. If you want to go for a spa-like experience, add some sun loungers or umbrellas to your deck so you can relax after a nice long soak. If you find you will be using your hot tub for primarily entertainment purposes, then there are a number of options for you as well. 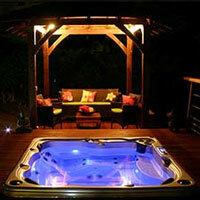 Choosing to purchase a hot tub for entertainment comes with a whole array of benefits. You can throw a party or gather friends any time of the year and for no specific occasion. Impress your guests with a pergola enclosure to add shade. Include an entertainment area next to the pergola where friends could sit on benches or enjoy to patio seating, maybe an outdoor fireplace or walk over to grab a drink at the bar area. If you are looking to take your entertainment into the night, add colorful lighting and a sound system to keep the party going. While these options may seem fun and exciting, they may not be possible for every backyard or every budget. One way to simply create a beautiful setting on a budget is to add mood lighting. This can be achieved with simply a hot tub, many of which include lighting that was designed with fiber-optic lights to allow for a relaxing environment. If your home has French doors or large open windows that look onto your hot tub, allow it to emit a glow which can be perfect for adding some ambiance to your home. There are many options when it comes to decorating your backyard and surrounding hot tub area. However, a hot tub alone can make any outdoor experience worth wild. Just make sure you take the time to plan carefully where you will place your hot tub. It can be very difficult to move once installed and filled with water. If you are looking for additional information on styles and features of hot tubs available, click here to download our hot tub buyers guide.